Home / Archive by categoryRace Results"
The hot topic on everyone’s lips in the VLN at the moment is the 5% reduction in power to the GT3 cars which comes within 3weeks from the beginning of the VLN season. A very controversial subject which teams and drivers have all been very outspoken about. Most notably Audi driver Chris Mies stated on twitter that he would have to consider racing in the VLN again due to this most recent set back for the GT3 cars. The main reason being that the GT3 cars would then be a very similar speed to the GT4 cars, Cayman Cup3 cars, and even slower than the SP7 (modified Porsche Carrera Cup cars) and the Cup2 Porsche Carrera Cup cars would be even faster than the GT3 SP9 cars in a straight line, due to the power and drag that the SP9 cars create from their levels of aerodynamics. Another issue rising from this announcement is the timing, only 2 weeks before the official VLN test day, and 3weeks before the season opener at VLN1. Team Wochenspiegel and their 2 Ferrari 488 GT3 cars will not race in the VLN until the BoP is adjusted to their preferences as well as long term entrants Frikadelli Racing will not compete beyond the N24hrs for the remainder of the VLN season. Their reasoning is very similar to what Chris Mies mentions about the SP9 cars will be driven past by the cars in the classes mentioned above therefore meaning the SP9 cars will have to re overtake these cars after the straight meaning there is more risk of accidents. Along with this issue, they are upset with the DMSB for releasing this rule change so close to the start of the season when the teams have already committed to the first 3 VLN races, N24hr Quali race and N24hr. They say that “had the announcement been made in November” they could have at least considered entering the races, however this late change leaves them committed to entering races where they now don’t agree to the technical regulations. Firstly I really hope that there can be some agreement between the DMSB, Team Wochenspiegel and Frikadelli as it would be a great shame to loose upto 4 cars that have become VLN regulars and add to the variety of manufactures on the VLN grid. Secondly, I can see where the DMSB and FIA are coming from. With a large amount of resurfacing work happening over the winter of 2018/2019, the new tarmac will most likely mean a reduction in laptimes further and closer to the 7:49.999 barrier which my team mate Christian Krognes got closer to at VLN9 Qualifying in 2018 completing the VLN layout in the Walkenhorst BMW M6 GT3 in 7:52.578. The most challenging race track in the world will become more challenging as drivers push their new machines harder and faster and with the old school nature of the circuit, the risk of an accident will naturally increase for all cars and drivers. So, by reducing the power of the fastest car classes, it will stop the headline classes being as fast. However by reducing the power of just 1 class, only reduces the risk of (an average) of 25cars in the SP9 class. However all the other car classes are still going faster and therefore increasing their risk, and then add in more overtaking due to the lower class cars now overtaking SP9 cars, surely the risk goes up even more for the remaining 125 cars in the VLN races….? Therefore I can see the point from Chris Mies that by reducing the power for all car classes should be considered. The 2 drivers from the teams that are threatening to quit the VLN can be described as Amateur or Gentlemen drivers with much experience that allows them to compete in the top VLN classes. These drivers are more likely to rely on the power of the SP9 cars to pass the lower class cars that have a faster terminal speed than the SP9 cars. Therefore this rule change is more likely to affect these drivers and the Pro/AM and AM class cars rather than the PRO class cars who should find it easier to pass these lower cars in the corners than the Gentlemen drivers. GT racing is mainly built on Gentlemen drivers and therefore needs to keep these drivers happy otherwise the sport loses fundamental supporters of the whole industry. My personal view is that the decision and announcement could have been made sooner. Christian did the 7:52 qualifying lap record in October last year, and at this late stage in the pre-season, to suddenly “move the goal posts” will upset some people. A power reduction maybe the simplest way to reduce the speed evenly, where other options like ride height, and ballast can affect all cars in different ways meaning within the SP9 class some manufactures might be affected more than others. I have been out dragged and slip streamed Carrera Cup cars, CUP7 cars and GT4 cars, but only really on the Döttinger Höhe. Other big straights on the circuit on the GP circuit, towards Schwedenkreuz, the Fuchsrohre, and from Bergwerk to the Karussell. It has been difficult to “power” past these cars, however the superior braking and aerodynamics of the BMW M6 GT3 have allowed me to pass these cars in the braking zones, through the corners and on the exit of the corners. So it will only be on the Döttinger Höhe where the SP9 cars will be passed. The riskiest part of the track will then be because after that we are onto the GP circuit which is the safest part of the circuit to overtake. So for me I am not too fussed by this rule change. When you watch the VLN live stream, you regularly see the Cup3 Caymans, TCR and GT4 cars battling for position slipstreaming each other. As they are fighting for their own class honours rather than against each other, and even though their lap times are very similar, there is respectable driving and to my mind I haven’t seen 2 different types of class car make contact and affect each other’s races due to the slipstream on the Döttinger Höhe straight. As long as the SP9 class manufactures are all as even as they have been after the 5% power reduction, it will make little difference to my race. Yes it is nice to have the fast times, however as long as it provides close and competitive racing, I do not mind and am still looking forward to the VLN season as much as ever! If you are at the VLN and N24hrs this year, please make sure to come to the Walkenhorst garage, see the car, take some photos and say hi! And post your Walkenhorst photos to the VLN Fanpage and social media! Please leave your comments below on your thoughts on the technical rule change and what you think to my thoughts, I’d love to know! Having burst onto the European GT3 Scene in 2018, after claiming pole position at the infamous Nurburgring Nordschlife, in only his third outing in a GT3 car, David Pittard has signed a new, two year, deal with Walkenhorst Motorsport, a leading BMW Motorsport customer team. 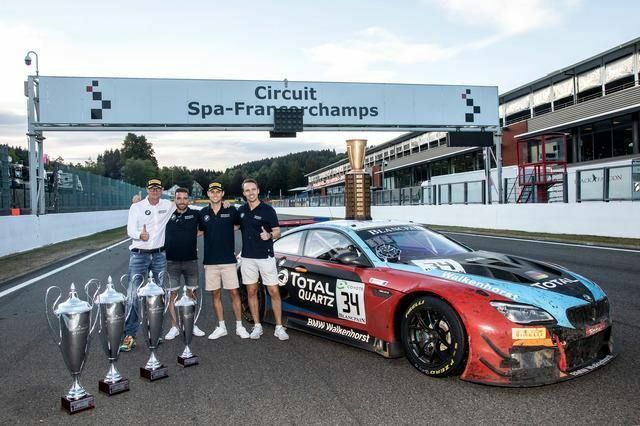 Walkenhorst are a top contender in GT3 racing, having won the Spa24Hours in 2018 with one of their BMW M6 GT3 cars. The extended contract engages Pittard for the full 2019 VLN season at the Nurburgring, the Nurburgring 24hrs and the Blancpain Endurance Spa24hrs, in a Pro line up, with a similar schedule for 2020. 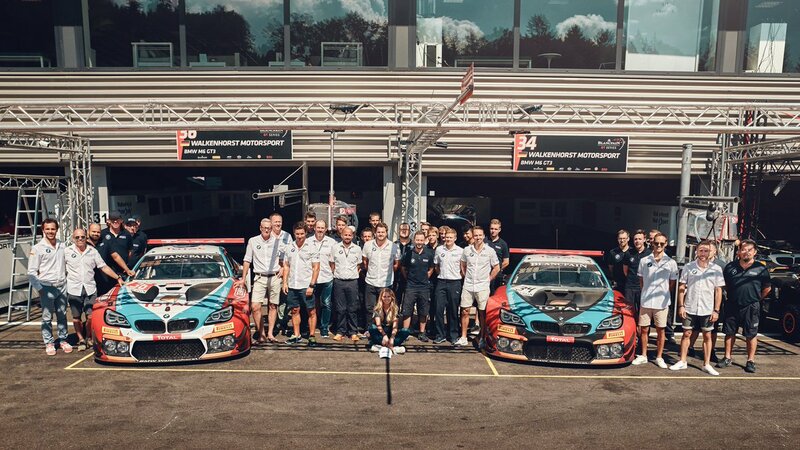 After visits to both Walkenhorst Motorsport headquarters at Melle German and BMW Motorsport in Munich, an agreement was quickly reached to provide for working together in the long and short term for these major events driving a BMW M6 GT3 car. The Veranstaltergemeinschaft Langstreckenpokal Nürburgring (VLN) Championship consists of 9 races (eight of four and one of six hours) all at the legendary Nurburgring. They uniquely combine the Grand Prix circuit and the Nordschleife to make the longest circuit in the world at 25km/lap and this, together with over 300m of elevation and the notoriously fickle Eifel weather, makes it the most challenging championship in the world. With up to 180+ cars entered from club racers to manufacturer supported “works” teams looking to prove themselves as the best, this is truly a race series like no other. The N24hrs is regarded as the toughest 24hr race in the world. The largest car and driver differential with 150+ cars on the most challenging circuit in the world throughout the day and night! Also in David’s calendar is what has become notorious as the most competitive GT3 race in the world…. The Spa24hrs. The event, now in its 71st year, is the blue ribbon event of the Blancpain Endurance Series and part of the Intercontinental GT Challenge, a worldwide GT championship. In previous years the Spa24hrs has attracted the very best GT drivers and the most competitive cars, so that the top 30 in qualifying have been covered by as little as only one second. Walkenhorst, who won in 2018 by 10.4 seconds after 24 hours of racing, will be back in 2019, in their M6 GT3 car, to defend their title. At the final VLN round of 2018, Melle based BMW Customer racing team Walkenhorst Motorsport announced that they would be representing BMW on a global scale by entering an M6 GT3 car into the Intercontinental GT Challenge, racing around the world at iconic circuits for races including the Spa24hrs, Bathurst 12hrs, Suzuka 10hrs, and Laguna Seca 8hrs. The VLN season kicks off on 23rd March in preparation for the N24hrs 20-23 June, with the Spa24hrs on 27/28 July, and then the remaining half of the VLN season will conclude a busy 2019. David will continue 2019 with support from Wilson Associates, Autoglym & VBOX Motorsport. David Pittard – A multiple British & European Champion as well as “ARDS A” Performance Driver Coach has over 19years experience in the worldwide Motorsport industry. Specialising in Modern & Historic endurance racing, David proven his speed & versatility in a range of modern and historic machinery in a safe and controlled manner at circuits around the world. VLN Championship – The VLN Langstreckenmeisterschaft Nürburgring is the largest grassroots series in the world. Nine times a year, 170 race cars – from close-to-production touring cars to full-blown GT3 cars – start on the world’s most beautiful and demanding race track, the Nürburgring Nordschleife. Walkenhorst Motorsport -60 years of automotive passion – Our claim. Our conviction. Our passion. As a family-owned company it is important to meet these fundamental values. Not only in terms of our drivers, but also in terms of our team and our partners. Because quality creates trust, success brings responsibility and passion is our advantage. Constantly we expand our knowledge and collaborate on the target – the development of unique, perfectly tuned race car. Reviewing my 2018 season, I have written up my top 6 highlights of the season for all the cool things I’ve got upto! Make sure you visit back the previous 5 articles to read up on these highlights! Enjoy! #1 – Pole Position at VLN6. My 3rd time in a GT3 car. If you have been following my 2018 racing career, then this will come as no surprise to you. A defining moment for me, my season and my career, a performance that put me on the Sportscar racing map! VLN4, my first run in a GT3 car, took place before the long summer gap! So I was raring to go for VLN5 the 6hr. However with an extra driver, I only got 1 very interrupted Nordschlife lap during qualifying and then in the race, my team mate crashed on his inlap to hand over to me. So I hadn’t really got much track time since my first GT3 race weekend, even though I felt I knew a lot of places I could improve, but I would have to wait a further 3 weeks until I could have another go at getting behind the wheel of a GT3 car and have a crack at achieving my aim of going sub 8mins! During Friday practice, I felt like I was driving very well and felt super confortable with the car, while pushing my comfort zones in the places I knew where I could improve having had a long time to look through the data. On Saturday morning I was given the “sacred” qualifying slot, the final 10mins, where the track is clearest and the flow of traffic is fastest! All the ingriedience for a fast lap, pressure on! Earlier in the session I completed my lap to qualify for the race on old tyres and even with a Code60 zone, achieved some fast sector times which, once on a lap with no slow zones, would have seen me go Sub8. This calmed me as I knew I just had to repeat what I had already done and the track would come to me! As I was still new and relatively unknown to the team this was a bit of a risk for them, so Rudi our most experienced driver took new tyres and set his own PB to go sub8. I took his tyres, and went for it on my first lap. I had Rudi’s time on my dash and tried to ignore it as much as possible, and drive my own lap, but when I encountered traffic I couldn’t help but glance to see what I would need to make up! I had managed to bring it back to level going into the final part of the lap, but then it suddenly dropped where Rudi had traffic and I was well ahead! I completed the lap in 7:57.491 and when I saw it on the dash I was over the moon! Objective complete. I was so happy I missed my braking point for T1 on my 2nd flying lap! The team then informed me that it was good enough for pole position, of which I was super surprised at. After that I thought, it will be beaten soon, however a Code60 on the GP circuit meant that people weren’t able to go faster and my lap stood! By the time I’d finished my 2nd flyer, I still didn’t believe that I’d still be there, but I was met by a cheering team boss Henry Walkenhorst who opened the door and helped me out! I stood on the side of the car, gave it the #1 finger to the cameras and jumped into Henrys arms! What a result, I had arrived! Confirming my ability to drive with the best on the world’s toughest circuit! Starting the race, having some of my hero’s and a lot of drivers I look upto in my mirror was a strange but awesome feeling, something I will never forget! Unfortunatly the race didn’t follow qualifying as the wrong compound of tyre was choosen at the start meaning after 2 laps the tyres were toast. I had to endure another 3 laps with no grip, before pitting for the correct compound. After that the pace would return even though we were well down the order, and eventually an engine failure put paid to the race and I had to stop out on track. However nothing could bring me down from the mornings result! #2 – Creating history winning the FIA Historic Sportscars in a Chevron B8! The opening round of the FIA Historic Sportscars at the legendary Imola circuit in San Marino! After what seemed like a very long winter, it was awesome to get to Sunny south Europe for some historic racing again! With my partner in crime Graham Wilson, I would share his Chevron B8 in the FIA Sportscar championship race, a 60min pitstop race in the Bonnier class, a mid grid class for 2.0 litre cars of which we would share the circuit with the larger engined Lola T70s and Lola T290s if different classes. Imola is a super old school circuit, even with the chicanes added in. Very fast and flowing that follows the Italian landscape and has a fantastic flow of long straights, big braking zones into some medium speed corners as well as some faster flowing corners which really ask you to commit on entry! In the Chevron it was a pleasure to drive! Especially along the long start finish straight which flows from left to right and allows you to pick up some big speed before it narrows into Turn1. It made for some big slip streaming! I hadn’t seen Graham drive this well since I have been driving with him. It was also his first time to the track, but showed his pre season preparation had paid off and he was one of the fastest in his class in both the Chevron and the Cortina he was driving that weekend. This made my job easier as Graham held his own off pole position, at the beginning of the race against some stiff competition before handing over to me at the ½ way point. We had qualified highly already, but with quite a scrappy race, there were a few incidents, mechanical problems, where we benefitted to gain track positions while still maintaining the class lead. The race continued its theme with a few safety cars thrown in as well, meaning that my team had stopped showing place in class on the pitboard but now overall positions! P5, P4, P3 and now chasing down P2 and pressuring them into a mistake gave us P2 overall as we finished the race which we were already over the moon with! Then after the race the leader was excluded for contact leaving us with the win! The first time a Bonnier 2.0 litre, class car had done this! An amazing track, a beautiful car, beautiful weather and record breaking result! The perfect start to the year! Reviewing my 2018 season, I have written up my top 6 highlights of the season for all the cool things I’ve got upto! Make sure you visit back in the final days of December to read up on these highlights! Enjoy! #3 – Joining Walkenhorst Motorsport in the highly competitive M235i class at the Nurburgring to complete my A Permit! This maybe one of, if not my most enjoyable race in 2018! The CUP5 M235i class in the VLN is one of the most competitive classes in the race. Identical cars, a good balance between grip and power with 0 aero, and a good balance within the VLN race, sitting almost in the middle of the race therefore you will be overtaking lots and being overtaken by lots also! I would share with Walkenhorst regular Alex Lambertz which made an exciting team! After a dodgy start to working with Walkenhorst during practice on Friday… the idea of “only” qualifying for my Permit A license was even more emphasised. 0 clear laps were completed without traffic or Code60s, as we only did enough to qualify for the race meaning we would start what would turn out to be P9 in class at the front of the 3rd starting group for VLN3. After a horrendous start avoiding drama from other cars, I dropped back to outside the top10, but quickly started to make many places back to run just outside the top 5 once the trace had calmed down. I then had a great race for the remaining 90mins of the stint with the Efiel Blitz and Bonk Motorsport M235i’s where we raced nose to tail for laps where it was cat and mouse between us as the traffic, Code60s and/or slip stream worked in or against our favour where I eventually managed to gap the P5 car to run P4 just before I pitted after over 2 hours of driving to hand over to Alex. Alex would then hold the gap ahead of P5 but the top 3 of the class were long gone down the road. One of the most fun races! Even machinery, an amazing track, great clean racers to race against. Everything that is fun about motorsport! I then qualified for my A permit to then go and race with the big boys! #4 – Winning the Spa6hrs again! With the race winning Elan being rebuilt since the last time it was raced at Portimao at the end of the 2017 season, and only having done 2 historic races all year, I was interested to see how we would fair this time in the 6hrs with it being so close last time out. Shaking the car down on the Thursday the car was quite different to how it had been, quite a bit more understeer than previously, so with Andy Wolfe and I sharing the set up duties, we managed to get a bit more speed out of the car which was comparible to the previous year, but without the set up balance we had last year. Going into Friday’s qualifying, the tracktime had been moved to later in the evening to allow the Masters Le Mans Legends to have the sunset slot. However this meant our qualifying took place in complete darkness which was pretty crazy! There were obviously a lot of people either not use to or couldn’t drive in the dark meaning there was a huge amount of traffic and some questionable driving standards. After a few more attempts than I would have liked at beating my time from last year, I came up .01 of a second short but with SO much more in the tank. Either way, it was pole position and time to hand back over to my co-drivers Shaun Balfe and Oli Stirling who were doing a great job at jumping into the car and turning consistent and competitive times! A strong line up! Shaun would start the race and did a fantastic job gapping the rest of the field by running away with the GT40’s that surrounded us on the grid and put us in a fantastic position for the remainder of the race, not having to take huge risks in traffic to maintain the large buffer we had. I would take the middle dusk to dark stint which I really enjoyed, almost driving 2 different circuits as the light drops away, as mentioned consistent laps and low risk overtakes were the order of the day and that’s exactly what we achieved, with a clean fuel stop in the middle, before handing back over to Oli to finish up in the dark. The remainder of the race was handed to us further with multiple lengthy safety cars which neutralised any chance our competitors had of catching us, and until the final 20mins the mighty little Elan was running P5 overall, but with the green flag conditions allowing GT40s to save fuel and close the gap on us we would end up P7 overall, matching the best result for the car in the event. A great event with some amazing cars and people. Defiantly a recommend a trip if you’re into anything like the Goodwood Revivial! #5 – 55years apart, 2 circuits, 1 day! This was quite a surreal day! I was very lucky to have the opportunity to drive a 1963 Lotus Cortina at Goodwood for the Goodwood Members Meeting and a 2018 BMW M4 GT4 car at Donington Park for the British GT Media day… however the catch…. Both were on the same day! So, never one to miss an opportunity, I devised a crazy plan to make both happen! I would stay down at Goodwood the night before to firstly test the Andy Wolfe Lotus Cortina, do 2 15min sessions at Goodwood in the morning, before driving straight to Donington to drive the final session of the day there in the Century Motorsport BMW M4 GT4 car. The day would start off damp, Andy Wolfe would start off to shake the car down, to set the car up for the day, which also gave me a chance for the track to dry. Once I got behind the wheel, it was a patchy damp session which really kept me on my toes with the car always moving underneath me! I thought with it being a larger car, but with the same engine I’ve previously raced in a Lotus Elan that traction wouldn’t be so much of an issue, however with full throttle and any deviation from straight with the steering wheel the rear was trying to overtake the front in true Cortina style. In comparison to the Elan, the car is a little lazier, a little slower in its reaction but as a result more manageable with the longer wheelbase making it easy to make long slides! Awesome fun! First session out the way, it was time for a quick debrief with Mr Cortina (Mr Wolfe), about the set up. We didn’t change anything as the conditions were drying, and I was still adapting to the car. With the track drier it was possible to push more with more consistent conditions and slowly worked my way down to a reasonable time and collected some good data for Andy when he drives at the Members Meeting later that month. After that, I jumped straight into my road car, still in my race suit and boots, to drive upto Donington to the British GT Media day. I had been talking very closely with Nathan Freake from Century about joining their GT4 team for the 2018 season, and he very kindly invited me to drive the car. I would again get a 15min session to try the car around the Donington Park GP circuit in the dry which was perfect! I jumped in straight after Jack Mitchel to try the M4, it was a busy session dodging AM drivers in other GT4 cars and avoiding fast approaching GT3 cars! I had to adapt my style to be neat and tidy again now I was back in a modern car and once I got a clear lap I was able to put in the fastest GT4 lap of the day, which I was super surprised about but super happy! It was a pretty cool day, and something I loved! Jumping into different machinery, at different tracks and adapting quickly to be fast! #6 Watching Walkenhorst Motorsport win the Spa24hrs! The Spa24hrs. The blue ribbon event of the Blancpain GT season! The most competitive GT3 race in the world! And to add to the prestigue, 2018 was the 70th running of the twice round the clock Belgium classic! It was also the only of the “big 3 24hr races” (alongside LeMans & Nurburgring 24hr) that I hadn’t attended, so now that I was driving for a team with 2 cars in the race it made perfect sense to get myself to the event! Having driven down Friday evening, I arrived at the track Saturday morning. I had watched qualifying on Thursday at home, and then Super pole at the Eurotunnel terminal as I waited out my 3hour delay as saw that the team had great potential for the weekend. The #34 car driven by Christian Krognes, and BMW Factory drivers Phillip Eng & Tom Blomqvist had qualified on provisional pole in qualifying with a best average qualifying time from all 3 drivers, with Eng putting the car on P8 in the Super Pole session. This was Walkenhorst’s first entry into the Pro class, so to have these results this early in the weekend was very positive! To help the team out, I was looking after some Total & Walkenhorst guests in the Radion Chateau based overlooking Eau Rouge! I talked about what the drivers & team members would be going through over the following 24-36+hours! After that it was a chance to say hello to the team, look around the pits and cars during their final prep before the race! The day rushed past very quickly and before I knew it, I was back at the Radion Chalet watching 62 cars taking the start which was awesome to watch! Eng in the #34 car would start the race making up 3 places in the first stint to be running P5, however disaster would strike the AM class #36 car as contact in the first 15mins would damage the steering up Eau Rouge, meaning an unscheduled pitstop and putting the team on the backfoot. The #34 car would continue to run in the top 5 thoughout the evening as the track fell into darkness. Nothing too exciting or out of the ordinary happened to the #34 car, all the team members and drivers performed like clockwork putting in very fast stints, (it was quite special to watch Eng in the car. He was so quick and so consistent lap after lap compared to his rivals around him!) and benefitting from small mistakes from their rivals to now start running into the top 2 with the #7 Bentley throughout the night. As the sun came up and I started to flag…. I kept falling asleep in the garage on the chairs, the mechanics and engineers continued to do their faultless jobs, I hid in the truck and caught a couple of hours sleep to get me through the rest of the day! The team managed to overcome a couple of lap deficite due to taking their technical pitstop earlier than others to be running P1 & P2 depending on the pitstop strategies and safety cars. It was becoming a 2horse race between the #34 car and the #99 Rowe Racing who were swapping places all the time due to pitstops, which was working towards the #99 car due to the positioning at the hour of the race. However with around 4hours to go, a safety car came at the right time which meant all the top 5, all on the same lap still, all ended up on the same strategy! It became a straight race between pit crews and the drivers! All 3 drivers again drove faultlessly, especially Philipp Eng who drove a triple stint at the end of the race, over 2.5 hours under huge pressure managing a 20sec gap to P2, against fellow BMW works driver Alexander Sims. Eventually, the little team that is Walkenhorst Motorsport, with their first PRO entered car, crossed the line first ahead of the “works” entered Rowe Racing #99 BMW, a historical 1-2 for BMW Motorsport, another reason for celebration! I joined the (emotional) team at the base of the podium to watch the 3 drivers pick up the GIANT Spa24hrs winning trophy as well as team manager Henry Walkenhorst collect the team managers trophy and spray plenty of champagne, before retiring to the BMW hospitality to celebrate with the team! I don’t think my first Spa24hrs experience could have been any better! It was a brilliant experience to be a fly on the wall with the team, see how they operate, see how the drivers manage their race weekend which is such a strain on both body and mind! Watching the start from the Chataue overlooking Eau Rouge, I felt I had the 63rd best seat in the house (After all the drivers! ), in the future I hope to have one of those 62 seats! A dream team was put together to finish the 2018 VLN season with a big bang, however factors out of the Walkenhorst team & drivers hands played a part in a DNF in the 4hour race in which the #34 Snow White car was on for a class win and top 4 overall. The weekend was set to be a good one with David being partnered with regular Bronze driver Rudi Adams, in David’s words “Probably the fastest Bronze driver on the VLN grid” as well as Walkenhorst driver & Spa24hr winner Christian Krognes to create a very competitive Pro-Am car, a 3rd BMW M6 GT3 car for Walkenhorst with a special SRO Intercontinental GT Championship livery announcing the teams intention to run a car in this worldwide championship for 2019. The weekend started very well with the Walkenhorst team making a great call to send Christian on his qualifying lap with a Code-60 at the end of the lap with the hope of it clearing before he got there. It did, and with very little other traffic on the track due to this, Christian set a new Qualifying lap record of a 7:52.5, to beat his own previous record by just under 1sec. Christian would start the race, holding P4 before the stops after being shuffled down the order in the opening laps. A short first stint and early pitstop got the Walkenhorst car out of traffic and with David installed into the car exited P2. At the end of his first lap David dropped 1 position to P3 and worked with Luca Stolz in the Black Falcon Mercedes to close the gap to the P1 HTP Mercedes of Maxi Gotz over the 1hour stint, while gapping the rest of the field significantly. David would hand over the Rudi Adams before a long stint to the end with Christian back at the wheel. Unfortunatly on lap2 of Rudi’s stint a warning message displayed on the dash, forcing him to pit to check the warning with the team, before further investigation lead to the car being retired. VLN9 closed off a big year in David’s career, proving his ability against some of the best GT drivers in the world, on the toughest track in the world. October 20 marks the 9th and final round of the VLN season at the Nurburgring Nordschlife for 2018. After an amazing debut season on the legendary Nordschlife picking up pole postion, fastest lap and running with some of the best GT drivers in the world, aspiring Professional GT driver David Pittard is looking to sign off with a win in the SP9 class! For VLN9 Pittard will be in the SP9 Pro-Am class paired with Blancpain Spa24hr winner with Walkenhorst, Christian Krognes and regular co-driver Rudi Adams. A very competitive combination for both overall and Pro-Am honours! David Pittard – A multiple British & European Champion as well as “ARDS A” Performance Driver Coach has over 19years experience in the worldwide Motorsport industry. Specialsing in Modern & Historic racing, David proven his speed & versatility in a range of modern and historic machinery in a safe and controlled manner at circuits around the world. An ambassador for Autoglym, VBOX and XPEL.